Prepared for her launching in less than 16 months, USS Lexington was originally to be named USS Cabot. A petition submitted to the Secretary of the Navy by the vessel's construction work force asked that she be named for the CV-2 scuttled by the Navy after sustaining serious damage in the Battle of the Coral Sea in May, 1942. Lexington served as the flagship of Fast Carrier Task Force 58 under the command of Admiral Marc Mitscher. Mitscher is credited with making the aircraft carrier task force the predominant naval weapon system of the 20th century while aboard Lexington in the western Pacific. Lexington participated in every major naval campaign from Tarawa to Tokyo and was hit twice by the enemy. Lexington was nicknamed "The Blue Ghost" by the Japanese propagandist Tokyo Rose because she never wore the typical camouflage paint of all the other U.S. aircraft carriers. 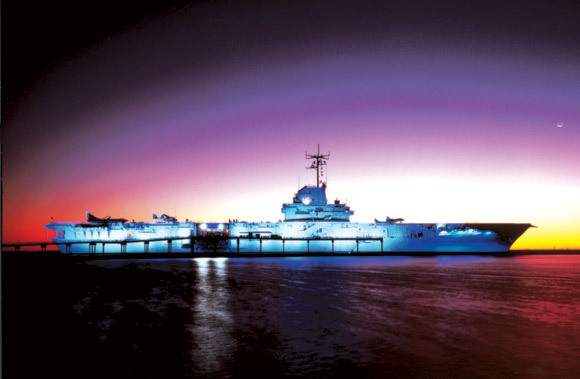 After World War II, Lexington was modernized and recommissioned in 1955 for Cold War service in the western Pacific. 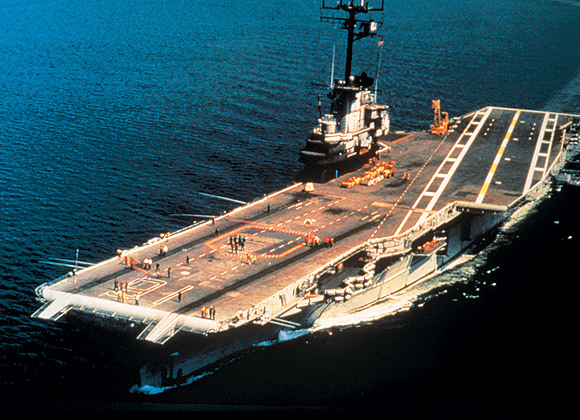 In 1962, she was assigned to serve as the Navy's training aircraft carrier, a duty which she performed until her decommissioning on November 26, 1991. With a half century of service, Lexington holds the record for the most aircraft launched and recovered of any of the world's aircraft carriers, and was first U.S. Navy ship to embark female crewmembers. USS Lexington offers Science- Aboard-Ship education programs for students and conducts youth overnight encampments.